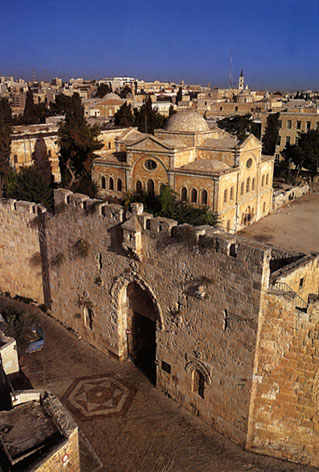 The walls of Jerusalem's Old City have been more or less in the same place as today from the first century CE onwards. That is remarkable because they were destroyed many times. There is one exception: just after the destruction of the Temple by the Romans in the year 70, when Jews were forbidden to worship in the city, and the population dwindled starkly. But the emperor Hadrian built a wall along the familiar outlines again, which today denote the Old City, after he had destroyed the old walls in the showdown of the Second Jewish War (132-135 CE). The Roman Jerusalem, now named Aelia Capitolina, was not a busy place as all of its Jews had been banned. Jerusalem popped back to life only in the 3rd century, when the Roman empire became Christian and pilgrims flocked the holy city. That's why empress Eudokia included the City of David in the new wall that she built, because citizens had sought homes in that part. But in the 10th century the southeast suburb dropped off again, after Jerusalem had peacefully adopted Islamic rule. Caliph el-Aziz was not convinced that the city of David had any strategic value in an expected attack by the Byzantine emperor John Zimisces. In the struggles between Moslems and Crusaders a series of new walls were built and destroyed before the present walls were undertaken by the Ottoman sultan Suleiman the Magnificent (1520-66). He was a tireless conqueror, whose campaigns took him to Europe, Persia and Iraq, and when he started his Jerusalem project he was still embroiled in war. But Jerusalem's walls were crumbling and Suleiman deemed strong walls essential against possible threats from Europe and local Bedouin tribes. Despite the necessity, the work was very slow. It started with the north wall, because Jerusalem had always been attacked from this side in the past. Only three years later, in 1540, the south wall was completed. The problem seems to have been money; in the end most of it arrived from Damascus in a silver transport that was accompanied by the Sultan's private troops, the Janissaries. The rest was paid from local taxes. Work on the south wall was held up because of a dispute about whether Mount Zion was to be incorporated or not. In the end it wasn't, to Suleiman's chagrin, because he wanted to harbor all Jerusalem's inhabitants regardless which religion they adhered to (Mount Zion was owned and inhabited by monks). When he returned and found the wall a fait accompli, he ordered the execution of the two architects. According to another story he executed two monks. Since the time of Suleiman, none of Israel's new rulers had felt compelled to improve upon his architecture, and indeed it is hard to see how that would be possible. 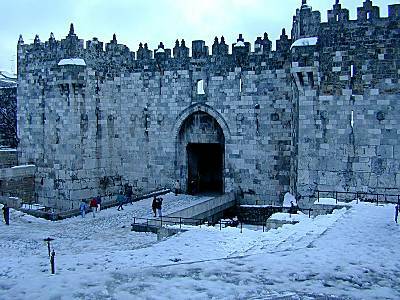 The two main gates, Jaffa and Damascus gates, were enforced with towers. There are 35 towers in all and both these and the walls have turrets and merlons from where snipers could fire. Four of Suleiman's gates retain their original L-shape. The other two have been widened to accommodate cars instead of donkeys. All gates still have their Ottoman decoration: a curved lintel with Arabic inscription, under a broken arch. Their doors were made of wood and iron and were locked every evening. The gates all have an Arabic name, but also a Hebrew one, and sometimes more than one, to make matters confusing. The importance of gates are attested to numerous times in the Bible, for instance in Psalms: "Our feet stood within thy gate, O Jerusalem, Jerusalem built up, a city knit together (122:2-3)." Prophetic words, or maybe just utopian. Nowadays, some of the old exciting hustle and bustle is concentrated around the Damascus Gate. The other gates are quieter. It's a good idea to visit the walls on the ramparts. Opening hours are on weekdays and earlier hours on Friday, tickets are available at Jaffa Gate or Damascus Gate. The attractions consist of magnificent views over Jerusalem and explanatory signs. There is a protective railing. Alternatively the wall can be traced by foot on the outside path. 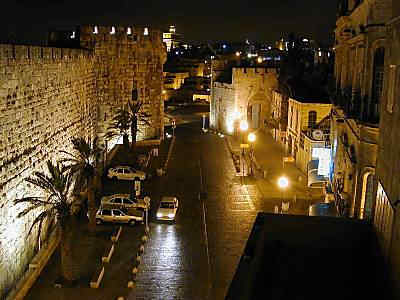 Jaffa Gate is called so because of the Jaffa road leading to it. Suleiman's name for it was Bab el-Khalil, the Gate of the Friend, which is a reference to Hebron which takes its Arabic name from Abraham, the friend of God (Isa. 41:8). In 1917 the British general Allenby entered the city through it. Under Jordanian rule, from 1948 to 1967, the door was closed. Just inside the gate, legend accords the two graves behind the iron fence to the executed architects from Suleiman's age. Or to the monks of Mount Zion. But actually they are of a Jerusalemite couple. Behind Jaffa Gate there is a breach in the wall. This part was taken down and the Citadel of David's moat was filled in 1898 when the Emperor Wilhelm II of Germany visited the city. His carriage rode through it, just like taxi's today, and Wilhelm did not need to descend. The area from Jaffa Gate to the southwest corner has been excavated on the outside and shows older versions of the wall. Suleiman's wall was built on the second century Hasmonean wall, which can be seen at a projection at the first tower's base, and also in its outer corner. King Herod (37-4 BCE) built a wall just outside the Hasmonean one. His wall was thicker because he needed a strong wall to buttress his palace which lay just on the wall's inside. The next tower is Herodian at its base, which is visible between the rock. On top of it stands a Medieval tower, which is itself crowned by Turkish stonework. One balk is left to show the ground level before the excavations. The Herodian wall leads to another tower, which had an earlier first century gate. Through this, the Romans entered the city in the fall of 70, as is related by the Jewish historian Josephus Flavius (The Jewish War 6:374-99). The two towers on the right of the gate are both Turkish. The last one was built on top of a gigantic medieval tower which had been destroyed. In Arabic it is called Bab Nabi Daud, or the gate of the prophet David, because king David is believed to rest on Mount Zion, which this gate discloses. In 1948 the gate was riddled with bullet holes during the fighting for the Jewish Quarter. The Palmach fighters reached the gate but did not hold it. Here again the excavations have been preserved and have explanatory signs. Inside the gate, to the right, there are ruins of diverse Medieval and Arabic bulwarks and a large four-columned hall. The eastern part of the hall served as a bathhouse. In the corner of the wall there is an amphitheater, built on a Byzantine cistern, whose inscription dates it to 549 and attributes it to the emperor Flavius Justinian. Outside the Zion Gate, the excavations show the Arabic tower that is also seen on the inside, projecting from the wall. Just before the corner a part of a first century aqueduct is visible; this used to bring water from Solomon's Pools near Bethlehem to Jerusalem. Another part of it can be seen in the next section, near the Temple Area, where a deep narrow channel runs under the wall. Near the path there are the ruins of a Jewish house that was destroyed by the Romans in 70. The Arabic name Bab el-Magharbeh means the Gate of the Moors, a reference to Muslim immigrants who came to Jerusalem from North Africa during the time of Suleiman. Jews called it the Dung Gate after a gate that had been there in the wall that Nehemiah built: "And I went by the gate of the valley, at night, toward the spring of the serpent and Dung Gate and I saw breaks in the walls of Jerusalem that were breached and the gates consumed with fire (Neh. 2:13)." It was apparently used to clean out waste. The Dung Gate gate was widened in 1953 by the Jordanians who used it to drive vehicles to the citadel (because Jaffa Gate was closed). In the base of the wall, westwards in the direction of Zion Gate, there are remains of Jewish Mikvahs, the ritual baths, of the Herodian period and cisterns which were cut in the rock. The cisterns belong to houses of the same period. Next to the gate itself, on its left side, is a medievaltower. It has a postern gate which is called Tanners' postern gate, because of a cattle market that used to be just inside the wall and tanneries which were nearby. This gate, just after passing the Temple Mount, is called Bab el-Ghor, or Jordan Gate, but this name did not stick. In English it is known as Stephen's Gate, a name that refers to Byzantine pilgrims who used an earlier gate of this name to enter the city. The Hebrew name is Lion's Gate; this comes from the heraldic emblems of the Mamluk sultan Baybars (13th century) which are placed at either side of the gate. There is a local legend which tells that these are the lions that were ready to eat Suleiman's father, the Ottoman sultan Selim I ('the Grim') if he were to continue with his plan to destroy Jerusalem. The original L-shape of the gate was destroyed during the British Mandate in order for cars to reach the Austrian hospital. In 1967 Israeli paratroopers entered Jerusalem through this gate. Despite it having been widened an Israeli tank got stuck in it. The Arabic Bab es-Zahr means the Flowered Gate, because of the flower engraving above the entrance. It was named after Herod in the 16th or 17th century because pilgrims mistook a Mamluk house just inside the gate for the palace of Herod Antipas (41-44). Going towards Damascus Gate the channel of an aqueduct is visible. This is interesting because of pottery which dates to the 3rd or early 4th century, which demonstrates that the aqueduct went out of use, and the north wall was built here for the first time, accommodating the growing city. A bit further, the wall makes an inward curve, following the rim of an ancient quarry which is known as Solomon's Quarries. The entrance is across the bus station on Suleiman street, open all days. This vast cave was rediscovered in 1854, after it had been concealed by the Ottomans in the 16th century, but it was known in earlier times. Josephus Flavius' Royal Caverns mentioned in The Jewish War are probably this cave. In later Jewish works it appears as Zedekiah's Grotto, and furnished an explanation about how Zedekiah managed to break through the Babylonian army lines which had encircled Jerusalem (II Kings 25:4-5, Jer. 52:7-8). Some believe it was the quarry for the stone blocks for the First Temple (I Kings 5:15-17). But it could also have been a quarry of Herod. But there is no dispute as to its antiquity. Inside, there is not much to do, except to study the art of quarrying. Blocks were wedged loose after cutting a trench on three sides. The walls' niches still have black marks from the workers' oil-lamps. The best kind of stone and most sought after was white limestone, called meleke. This was ideal because it is easy to cut but it withstands erosion. In Hebrew it is called Shechem Gate, because from here the road leads to Shechem or Nablus, and ultimately to Damascus. It represents the finest example of Ottoman architecture in Israel. It is the only one that has been excavated to study earlier gates. The first was built by Herod Antipas, later followed by a monumental entrance to Aelia Capitolina, built by the emperor Hadrian. Its basic design resembles the current one and consisted of a semicircular plaza from which sprang the two main roads of the city. It had one arched gate and two pedestrian entrances on the sides. The excavation area can be reached from the gate's right, where modern stairs lead down. The first space is the Crusader Chapel of St Abraham, whose entrance is straight ahead. Passing this we stand on the medieval street, whose kerbstones are still visible. Steps lead to a Arabic cistern, whose collapse makes Hadrian's gate visible: the tower and pedestrian entrance are on the right. The tower is open on weekdays and Fridays before the Shabbath. Visitors can enter the guardroom and climb to the rampart or stroll over the Hadrianic plaza. In the exhibition of maps of Jerusalem there is also a holograph of a tall column with a statue of Hadrian. Many believe that this statue stood in the centre of the plaza. Possibly the Arabic name of Damascus Gate, Bab el-Amud, the Gate of the Column, derives from this. Indeed, some huge Roman memorial columns are located on Nablus Road, a few hundred meters to the north, and a head of Hadrian was found nearby. Hadrian's first gate remained in use until the 5th century. But in later centuries debris filled up the pedestrian entrances and the central entrance was raised. After that, the medieval gate used to be a short walk outside the present gate. It was flanked by two towers and connected with a road to where the bridge is now. This was not one of Suleiman's Gates, as its name and form indicate. It was built in 1887 by the Ottoman sultan Abdul Hamid II to furnish access to the new northern suburbs outside the wall. This gate was also blocked by the Jordanians between 1948-67. To the west of the gate there is a small park. Inside it the base of a large tower is visible. This is called in Arabic Qasr Jalus or Goliath's Castle, after the popular legend that David killed the giant nearby (according to the Bible, this happened in southern Judea). The tower itself dates to medieval times and is constructed of Herodian blocks.